We sat in the corner eating our breakfast in silence so that we could hear what was being said at the table next to us. This sounds like a terrible thing to do, but admit it, you do it too. We had been in Chefchaouen for nearly 4 days of our planned 5, which if you have considered a trip to Morocco before, it’s several days more than anybody in their right mind spends in this small heavenly town. We were playing the game of guessing where people were from, and our hotel was a great place for this given how quickly people came and went – one or two days and they were gone only to be replaced by more tourists with different accents. We were the only people, it seemed, who end their tour of Morocco in Chefchaouen, but some Europeans drive through Spain and cross into Tangier and make their way through the Rif Mountains. The people at the table next to us had interesting accents. After some guessing we simply started talking to them, which is the surest way to take the mystery out of our game. He was from Brazil but was Japanese and she was from Manila but was American. Both were living in Brooklyn and were in Morocco for 10 days to celebrate her birthday. With her blessing he had found a way to squeeze in some work. I found out some of these details while hunched with them in a low-slung room filled with bags of dried marijuana and kilo upon kilo of pure organic hash. 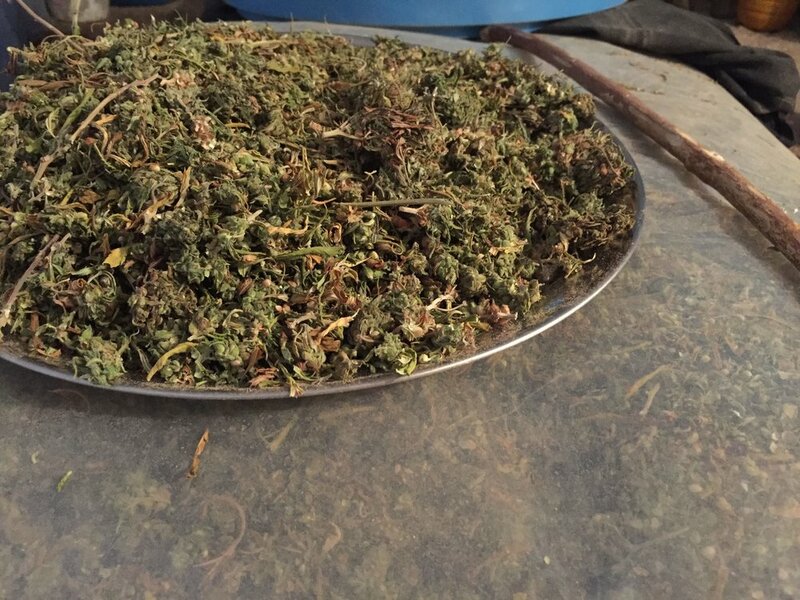 Hash is Huge in Chefchaouen?! The first time I learned about the huge hashish business in Morocco was when we camping in the Sahara. Our guide and friend Hicham kept forgetting to add salt to the tajin. He scowled and cursed his “hashishi head”. Turns out he used to live in Chefchaouen and had a daily habit of smoking loads of hash. He schooled me on the 100 year old tradition of growing marijuana in the north, specifically in the area surrounding Chefchaouen. He promised give me the name of a friend who could get me some “beldi” or organic and pure hashish. I promptly forgot to bring it up as a poison horned viper whipped itself clear of my foot. The end of our trip and any city life seemed millions of miles away when faced with a snake that wants to kill you in the Sahara. The couple at the next table were finalizing their plans to meet Gomez, the young man who checked us in. He would meet them when he got off work at the hotel around 3. The particulars of his job seemed only to be to get you anything you needed – laundry, restaurant recommendations, rides out of the city and advice. Oh, and apparently to bring guests to a small hashish farm outside Chefchaouen that has grown marijuana for 4 generations. I expressed interested in seeing this for myself and soon I found myself walking through the medina towards the Brooklynites rental car. As we walked, Gomez explained the reasons Chefchaouen is painted blue. I had read that it was brought by the Jews fleeing Spanish persecution, but he had lived there his whole life and knew what he was talking about. We drove carefully through the newer part of the city and out into the hills and past some roundabouts and after only about twenty minutes we parked and walked through a rutted field towards a gate. We were greeted warmly by M, the 4th generation of farmers and lead further and further into his small house until reaching a door next to the sofa in the living room. He opened the door and ushered us inside with a grin. All five of us huddled under the low ceiling astonished and gape mouthed. There were two plastic bags as round as a barrel and as long as two cars stuffed full of dried and stemmed marijuana. M. encouraged me to sit down on a small stool and proceeded to put me to work preparing the hash. M had wrapped a large plastic bucket with some kind of mesh and secured it with a bungee cord. This he placed inside a clear plastic bag. On this mesh drum was placed a heap of dried marijuana and this was sealed tightly. Two images passed before me as M handed me two long sticks and pantomimed for me to start beating the wrapped pile of marijuana. One was my future self standing in a small curtained off cubicle at the Tangier airport while my hands were swabbed and my bag eviscerated before greedy drooling dogs. The other image was a row of naked and blindfolded women processing drugs in New Jack City starring Ice T.
I mentioned this to the Brooklynite who was snapping pictures with the nicest camera I’ve ever seen. He laughed heartily and then started to art direct me a bit – this is the work he was here to do. He was a photographer on assignment for a magazine. Apparently I wasn’t doing this well enough so Gomez took over and really beat the hell out of plastic while I acted like a professional photographer. M supervised and looked at our photos to make sure that our pictures contained no faces. While the practice of growing and selling and smoking hashish in Morocco is an old tradition, the new king doesn’t look on it so kindly and so it remains illegal. When Gomez was done, the bucket was unwrapped to reveal the plant material left on top, which is called kif, and inside the bucket a fine beige powder, which is the hash. He took a small palm full and began heating it with a lighter, encouraging us to smell it. After a few seconds the hash started to gum up and became sticky. He rolled it into a ball and passed it around to our general amazement. We moved to the living room where an Iranian soap opera softly flickered on the screen at one end of the room. At various times several cats and dogs were chased from the room. A tray of olives and bread and mint tea adorned the table and we watched as Gomez and M and his brothers chatted amicably. A long cedar pipe ringed with silver and camel bone was produced and the end of it was dipped into a little bag of kif. M lit it and took a few puffs, smiling happily. When he was done he aimed the hot end of the pipe towards the television and blew the ember onto the floor. Gomez turned to us and asked if we wanted to see what a kilo of hash looked like and we all nodded enthusiastically. He brought it out and set it on the table next to the olives and tea and the photographer fumbled with the bag as he brought it to his face to inhale with the luxuriant drama of a true pothead. I imagined him accidentally dropping it on the ground when I asked Gomez how much it was worth. He paused a minute calculating and chatting in Arabic and doing conversions. “Roughly $3,000 US dollars” he said calmly. Do women work in the hash industry? The pipe was prepared for me and I took a deep lungful. It was warm and light and sweet and I held it like a swimmer before exhaling. My head was suddenly a balloon bobbing over my collar but the thought passed as quickly as it came and normalcy resumed. I looked around at the room full of men (aside from the photographer's wife) and asked if there were women involved in the family trade. It was explained that women did not smoke and were in other rooms when guests arrived and when I pressed about the reason for this M shrugged and explained that a woman’s world is a secret. So much a secret that they may indeed be smoking hash, they just don’t talk about it. I explained that for an American it’s unusual to have such separation of men and women. He chatted for a long minute with Gomez who in the end didn’t translate back into English and we left it at that. That was the extent of my smoking and our conversation. We shook hands and thanked the family we could see and headed to the car. I stood away from the car, drawn by the sun setting like a peach behind Chefchaouen and the fields stretching before us. I took a picture as my final memento of my time visiting a hashish farm in Chefchaouen. If you like this content, you’ll love our emails! Older PostWhy is Chefchaouen Blue?